The question is not whether I’d sing to an apple tree, but rather where I can find an apple tree to sing to. My Oklahoman neighborhood just doesn’t deliver the crimson fruit. Regardless, I will tipple this wassail with a cheer (wassail literally means “wes hail”, or good cheer)- after all in 2014 I’m learning about celebrations around the world, a suitable follow-up to completing our first adventure: eating one meal for every country in the world. 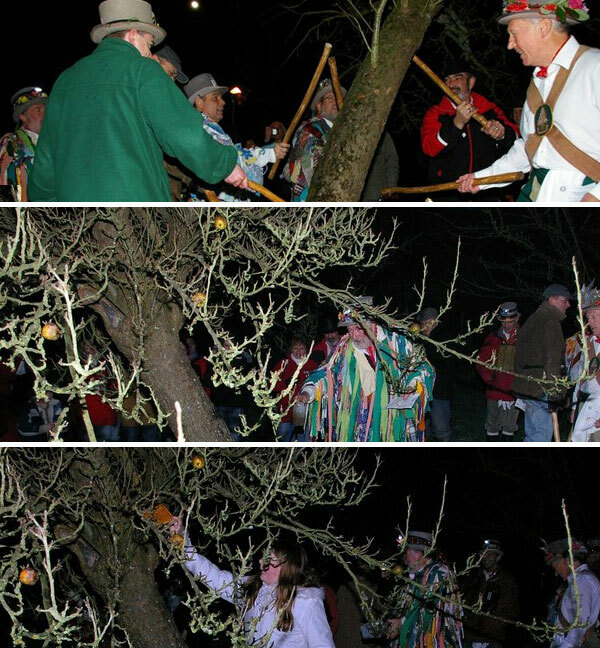 January is all about wassailing. Wassailing is the Southern English art – yes, art – of cooking up some of last year’s apple crop with cider – sometimes with a flush of orange peel, warm cinnamon stick, flecks of nutmeg, or maybe allspice. To make it… just… Roast some apples. Click on the burner and clank on a pot of cider and spice. In a moment, heat shimmers through the pot and those first bubbles pop the surface. Seconds later, sweet apple and spice billows through the house. The roasted apples are whipped into a froth, then stirred to thicken the cider. 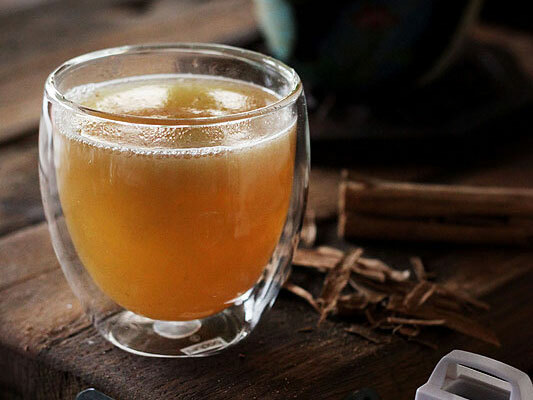 Wassail is the kind of recipe that makes me feel like I have a fireplace. The flickering spice lights me from within, like a candle. The bitter cold can’t get me with a mug in my hand. Wassail is the heavenly scent those $15 apple-scented candles are trying to capture (and so desperately failing). Wassail is, by all rights, a way to honor the old while anticipating the new. Because, even in the heart of winter, we can sense it – there’s new growth on the horizon, whispering on the icy air. But sometimes we have to shake a stick at it. Sweeten things up. There are two dates for wassailing: Either on the 12th night of Christmas ( January 5th/6th) or, more traditionally January 17th (the original date for 12th night, before the calendar changed to the Gregorian style, in 1752). Wassailing can be done in a neighborhood or in an orchard. For those who owned an orchard, the tradition was different and, possibly, more urgent. A hunk of bread was dipped into the wassail, then hung from the apple tree (much to the delight of area birds). Sometimes the warm wassail was splashed over the apple tree’s roots. There’d be singing, processing, and even a wassail queen (usually a child) to do the honors. An’ all under one tree. Hurrah! Hurrah! “Look what a good job you did last year, apple tree! I dug up two wonderful resources. The first, an brittle book of Holiday Punches from the 1950’s (I found a copy on Etsy for the curious cook). 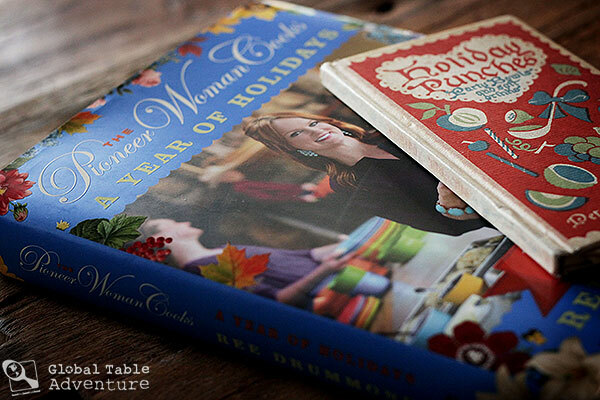 The second, a hot-off-the-presses book by my fellow Oklahoman blogger, Ree Drummond… The Pioneer Woman Cooks: A Year of Holidays: 140 Step-by-Step Recipes for Simple, Scrumptious Celebrations. Given this year’s challenge, I’m very excited about her month-by-month exploration of recipes. 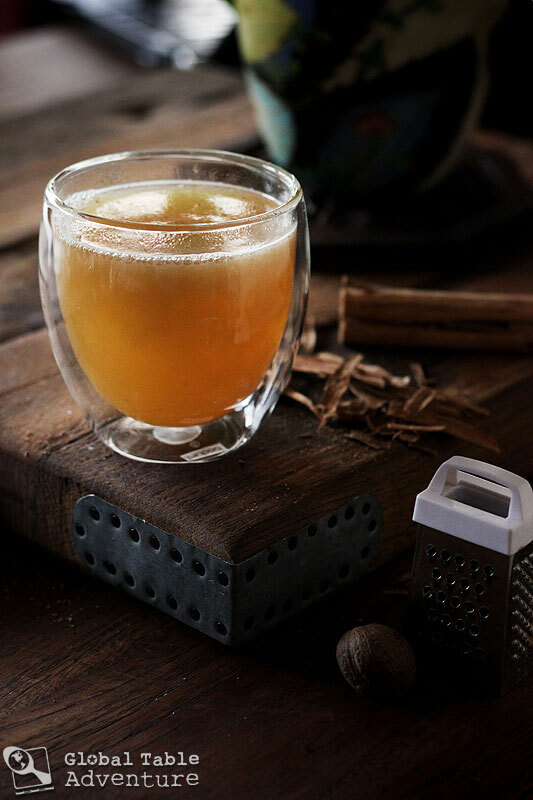 In her Christmas chapter, Ree’s American Mulled Apple Cider delights, with perky cranberries and a quick dice of apples – a lovely, modern twist to the traditional wassail recipe. 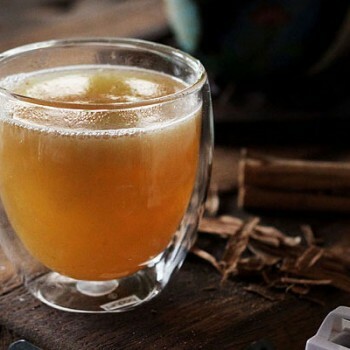 Tippler’s Tip: Switch the sweet cider for hard cider, if the mood strikes… or do like Ree and add some brandy. Preheat the oven to 375F. Core the apples, leaving a small patch of flesh and skin on the bottom. 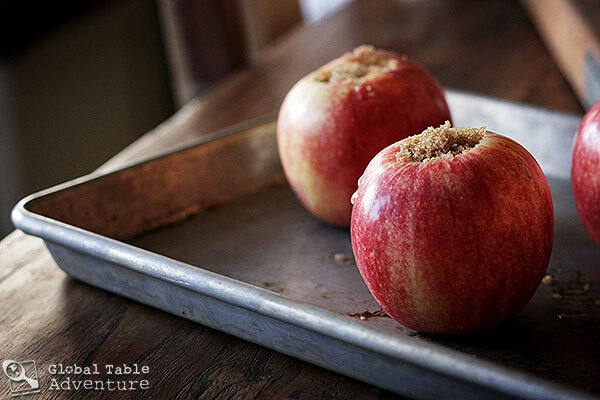 Stuff the cored apples with brown sugar. Place on a baking sheet with a thin layer of water. Roast until tender – about 45 minutes. Meanwhile add the cider to a pot. Toss the orange peel in, along with the cinnamon sticks. Squeeze the orange into the cider. 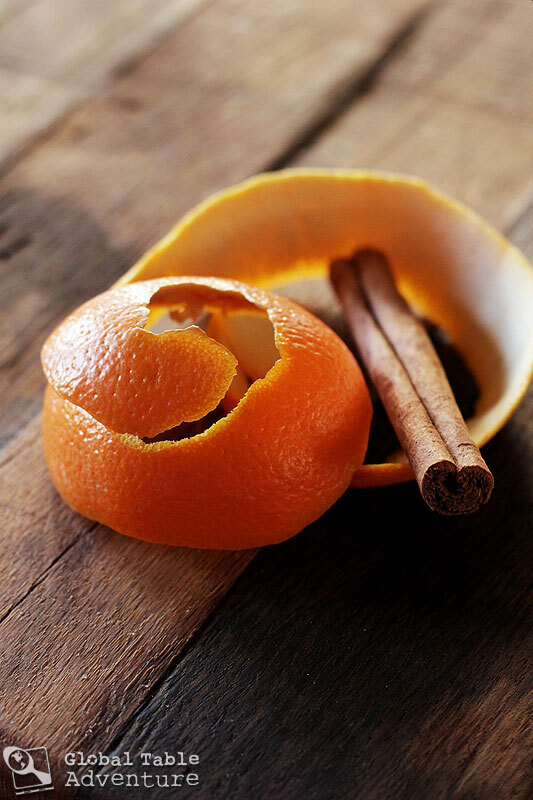 Remove cinnamon stick(s) and orange peel. Peel the hot apples and remove the bottom flap of skin. 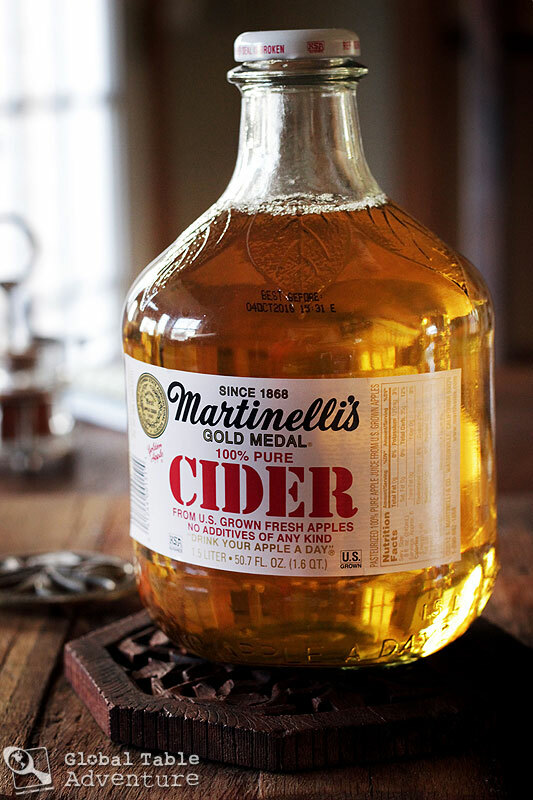 Whisk the baked apple flesh into a mush and stir into the cider. 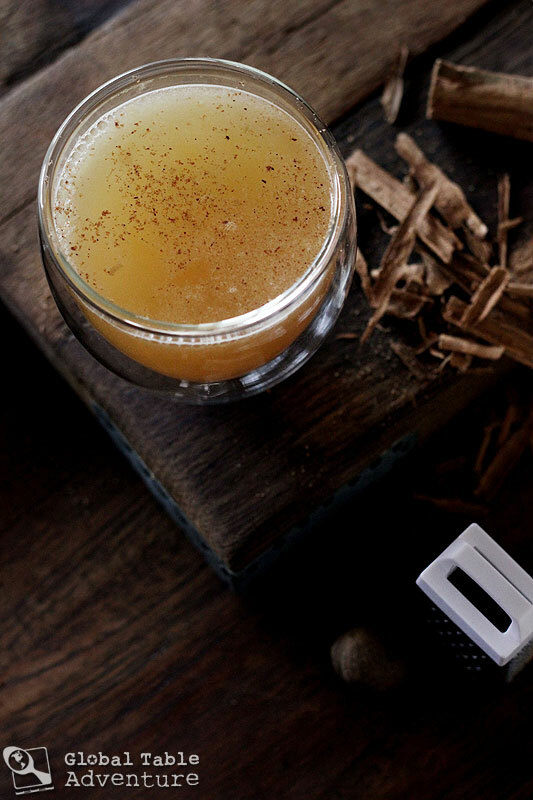 This makes the drink more of a “lambswool” – for more information, check out Recipewise. Once it’s stirred into the cider, I like to use an immersion blender to get it really smooth. The roasted apples add body and the most wonderful, fresh flavor. Serve hot with fresh grated nutmeg. Preferably around an old apple tree! Wassailing is the Southern English art - yes, art - of cooking up some of last year's apple crop with cider - sometimes with a flush of orange peel, warm cinnamon stick, flecks of nutmeg, or maybe allspice. Core the apples, leaving a small patch of flesh and skin on the bottom. 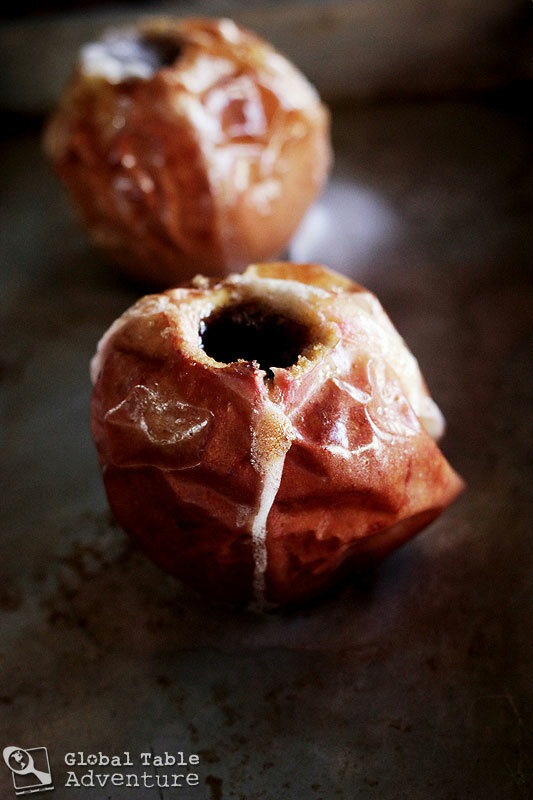 Stuff the cored apples with brown sugar. Place on a baking sheet with a thin layer of water. Roast until tender - about 45 minutes. Meanwhile add the cider to a pot. Toss the orange peel in, along with the cinnamon sticks. Squeeze the orange into the cider. Peel the hot apples and remove the bottom flap of skin. 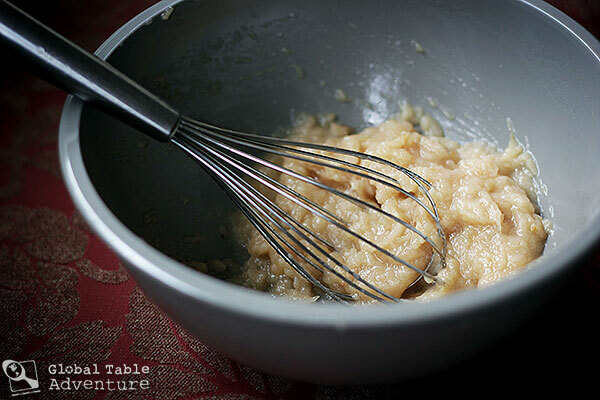 Whisk the baked apple flesh into a mush and stir into the cider. Use an immersion blender to get it really smooth. I’ve missed you so much that tonight I just pulled up Global Table Adventure to see if it contained anything new. It did! This Christmas season, I messed up our spiced cider someway. It was bitter and had to be thrown out. On my next trip to the grocery store, I’ll’ buy the “provisions” for your wassail and redeem myself. I am so happy you are doing celebrations around the world. I’ve missed reading your posts – glad you are back up and running in the new year! And I LOVE your new adventure, this will be a fun one! Yay you’re back!!!! !happy new year!!!! So happy to see you, Ava and Mr. Pickey are back with us!!! Nice to see you back! Did you know that when you feed the apple trees you sometimes also hang their branches with bits of toast? Oh yes! Your comment inspired me to add a few photos of this process – such fun. I am so delighted that you are back and “celebrating” just happens to be my all-time favorite hobby! he he! My favorite holiday is Christmas, followed quickly by Halloween (purely because of the costumes!) Thanks for your awesome blog… it is my go to over coffee every morning! I too, am glad you’re back! My favorite holiday would be Easter. It’s not as commercialized & stressful as Christmas & the weather is usually nicer. My favorite holiday is Thanksgiving. It is when my extended family all gets together. It is a tradition we have fiercely protected. We are beginning to turn some of the responsibilities over to the next generation, hoping they will continue staying involved. That sometimes means changing up the menu (a good thing) and joyfully expanding our numbers as little ones begin coming along. We have to get clever about how to set up tables for more and more people. I love this! More is a great thing. I am happy we’re all back for a new adventure! My favorite season is Christmas…so much good food, time with family, and where I am it finally starts to get cold! So happy to see you and family again. I have missed you! Like you, I am very interested in food from around the world so your blog has been wonderful. Every recipe I tried was great. Also, as a language major and cook, I believe there is no greater form of respect than speaking in the language of the country or learning about their cuisine. Why January 17th? Just curious. Great question… that was the original date, before the calendar changed to the Gregorian style, in 1752. Thanks you and this answer… I’m hosting a Wassail party on the 17th! Since it’s been -20 (real temp) in Minnesota for the last 4 days, I think we will all be ready for a hot drink! Peace & cheers! this provoked me to check the lyrics of a song on Sting’s Christmas (or should I say Winter?) CD. the song is titled Soul Cake, and I was off-base making a connection to wassailing, but interestingly discovered another celebration from that part of the globe – maybe checkout “soul-caking” or “souling”. thanks for your good will blog, Sasha. ohhhh my goodness. What a fascinating tradition! Thanks for the tip. Yay! New entries to share to my facebook page!!! happy new year, Sasha, Ava and Keith! I love Christmas. Cool weather. Close to my birthday. Family around. My favourite holiday is Christmas! I love the spirit of giving, general goodwill of the population, and the festivities that surround it. I love the Christmas tree, eggnog and the variety of cookies. I love the season of Christmas. I lived in an international community for 2 years, and the 6 weeks or so (starting with St. Lucia and ending with Orthodox) of different Christmas celebrations was so much fun! Oh, so I wonder if you did the King’s Cake then? Surprisingly, we never did – but now you have me wondering why some make Kings Cake for 12th night, and others for Mardi Gras? PS…HOLIDAY PUNCHES was one of the little books I sent to you…is this one you pictured, another one? I love your new quest. I think learning about each others traditions is a great way to bring understanding. I have enjoyed getting your posts for about 6months now and have enjoyed every one of them. I am very excited for what this year brings on your blog. Also my favourite holiday is most definitely christmas. Mainly because of my family, we barely see them for the rest of the year and because of the food. Every year the menu changes and I always look forward to what goodies we will be dining on. 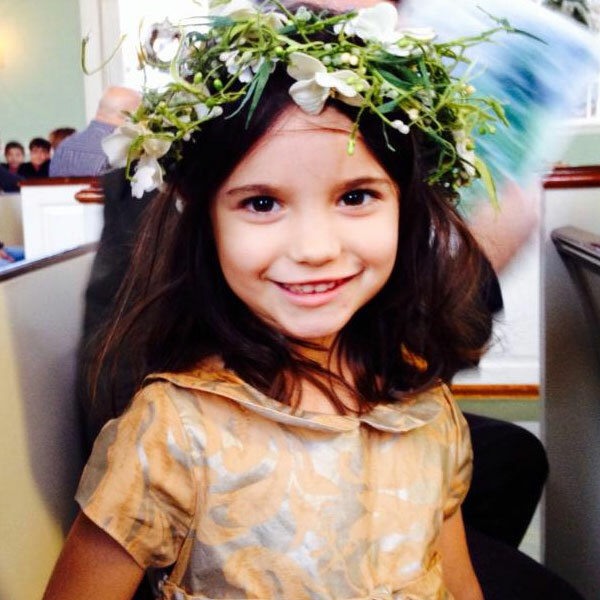 Thanks Elii – love the photo in your avatar, by the way! Thanks Sasha. Do you have to be living in the US to enter the competition? I love Christmas~the twinkling lights, celebration of Jesus. Can’t get any better!!!. My favorite holiday would have to be the Fourth of July. Sitting outside watching fire works. And food never tastes as good as it does when cooked over an open fire. I know it’s not really the time of year for it, but it’s been really cold lately, so we all need some warming up. Love your blog. Cooking Estonia tomorrow. My favorite holiday is Fourth of July. Nothing better than a picnic and fireworks. Oh, I’m so happy to see hat there’s new content in Global Table Adventure and also great to read that you’ll continue blogging this and dedicate this year to celebrations around the world, what a great theme! Ooo Queen’s Day! We ate the cake on a rope…. were you reading back then? That was so fantastic! My favorite holiday is Easter since at that time it is getting warmer and lighter leading into Summer. I’m glad to see you back – hope you enjoyed your time off. First of all, can I just say how much of a blog crush I have on you? I kind of want your life. There’s no holiday that really stands out as my all time favorite. I like them all for different reasons. I feel that Christmas has the most memories attached to it, so perhaps that one. My favourite holiday is Christmas, because i love the christmas lights and all the festive mood!! My favorite holiday is Thanksgiving. All about food and family! !